The remarkable run of results for Bathurst trainer Dean Mirifin continued on Tuesday with Prince Planet leading from start to finish in the Central West Electrical Country Class 2 Plate (1335m) at Bathurst. From the opening metres of the race Prince Planet ($3.80) dashed to the head of the field under the control of Jamie Gibbons and stayed there for his third career win, and his second at Tyers Park. Mirfin is already looking ahead to the $500,000 Newhaven Park Country Championships Final at Royal Randwick with Cosmologist on April 7, but both he and the Superhorse Syndicate added to their success with Prince Planet’s gutsy run. Gayna Williams-trained pair Skin Deep ($15) and Foxdown ($3.80) filled the minor placings. Skin Deep was the quickest runner across the final 100m but had too much ground to make up on Mirfin’s leader, missing out by a head. Gibbons returned to the track on Tuesday following a nine-day suspension and made his first ride back a winning one. Coincidentally, his last ride before his suspension was also on a Dean Mirfin winner, Repentant. Gibbons said he always felt confident Prince Planet could hold out his fast finishing rivals. “He wasn’t really tired at the end, he was just looking around. Since it’s his home track he’s just used to pulling up close to the winning post,” he said. “He’s usually a front-runner so all I had to do was give him that bit of dig and cross them. Gibbons got Prince Planet to the front comfortably when the barrier gates flew open. In the early running, he had a length and a half on the race’s other Bathurst-trained contender, Peter Stanley’s Catcha Crown. 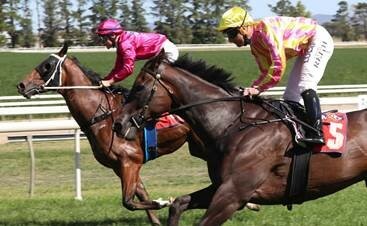 Race favourite Bonsley ($2.25) sat on the outside of Stanley’s runner. Prince Planet led by just over a length from Catcha Crown along the rail when the field rounded for home. Bonsley swung out wide for his challenge but with 200m left to run faded out of contention. Skin Deep had also swung wide in an attempt to chase down Prince Planet, but unlike the favourite his run under Christian Reith was making inroads. Prince Planet looked a touch lost over his closing strides but responded well when Skin Deep was within firing range. Foxdown finished a further two lengths away.